The chance to work with builders during a renovation is a win-win for everyone involved—actually, it's a win-win-win. As designers, it gives us a chance to choose finish elements that work best in the space. It gives the builders the chance to install fixtures and finishes in the most time- and cost-efficient ways. Not to mention, it's much more likely to result in delivering exactly what potential homeowners desire in a home. Budget is, of course, always a factor. Recently, I worked with a client who required a "luxe" look, but was constrained by a tight budget. With the help of builders, our design team came up with solutions that kept the investors on budget and the builders on time. The finished product was a gorgeous home with a kitchen at its centerpiece that added real value to the home and was highly livable. 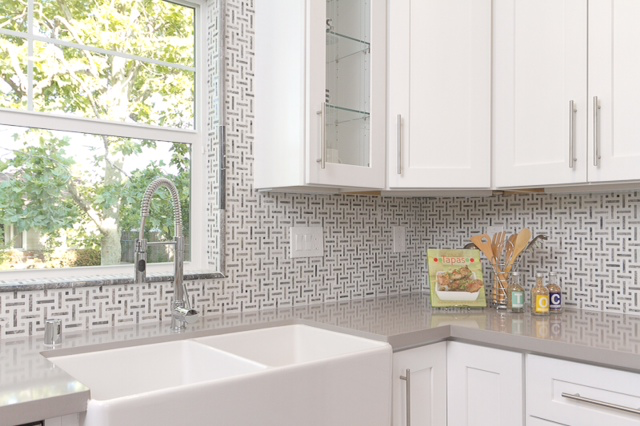 Stainless steel is the go-to finish to update any kitchen. Whether you're working with traditional or modern accessories and finishes, the clean, contemporary look of stainless steel will ground your kitchen in fashion and functionality. French door refrigerators give you commercial-grade luxury and accessibility, and we love that stainless dishwashers are available these days without a single one of the controls visible on the surface. You don't need a six-burner, commercial gas range to get the look, either—four burners work just fine for most of us, and still offer the same design benefit. If the budget is really tight, don't hesitate to look for a great deal on floor models. Stainless steel and white are the killer combo in a kitchen when you're looking for a high-end look on a low-end budget. 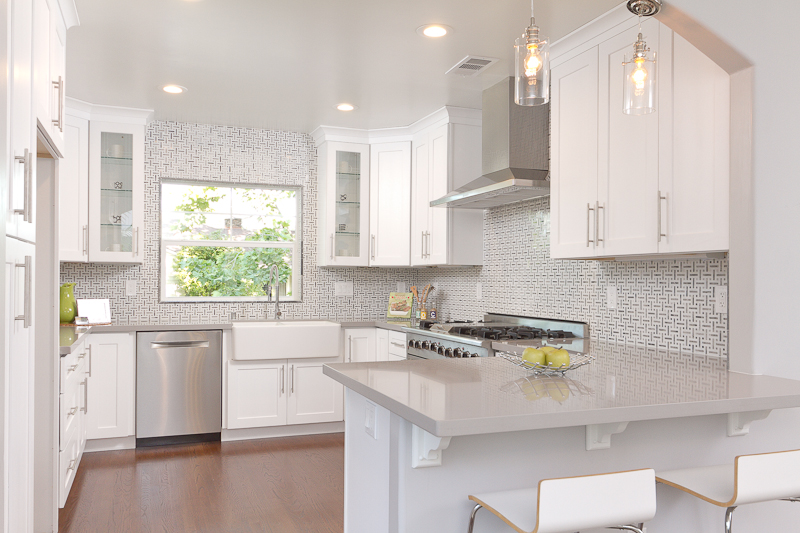 The semi-gloss paint brings durability, while pairing fresh, white cabinets with those stainless appliances gives a timeless and sparkling finish to the space. Functionality and durability are obviously crucial in a high-traffic area like the kitchen, but those are also elements that make you feel like you've indulged in the very best. Quartz is a manufactured stone that results in an especially rich finish; it's even glamorous in the right setting, and is completely stain resistant, which means that gorgeous look stays as long as the counters do. 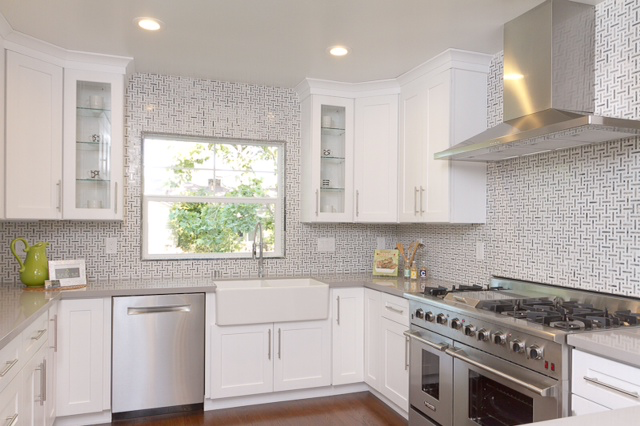 In this particular home, we chose a simple yet design-driven backsplash that set the whole space off. The stone finish is super durable in a kitchen setting, and the basketweave pattern brings texture that works beautifully with the higher sheen finishes and tones of the stainless appliances, white cabinetry and sleek and sharp quartz countertops. I am a big fan of the farmhouse sink. The clean lines and large basin make a bold statement that is traditional and contemporary at the same time. Best of all, it's one of the most functional products I work with. The basin is huge and we all know how well-appointed that feels when in use. As you've likely noticed by now, a big component of the luxe-for-less look are timeless materials, contemporary finishes and quality products. So, of course, we completed the look with a classic hardwood. Make sure you get at least a 25-year finish on the floors. That guarantees the quality and durability, and really contributes to the value of the home. Finish it off with stainless steel hardware for the cabinets to pull the look together and choose other accessories that make the space feel luxurious to you. Family photos in polished silver or simple, black frames, glass or ceramic accents and, of course, fresh flowers are the ultimate affordable yet chic finishing touch. We'd love to hear about the details in your own luxe-for-less spaces! Kerrie Kelly is a California-based interior designer who has won numerous awards for her design work, and writes about kitchen home décor for Home Depot. A large selection of inspirational kitchen design ideas on Home Depot's website can be found here.